Most Star Wars fans are aware that there are certain audio differences between the different versions of the original movie. In fact, there are actually six different sound mixes for the original Star Wars (another three if you include the mixes for the Theatrical Special Editions in 1997, the DVD in 2004 and the Blu-ray in 2011.) This article explains the background behind the various mixes and details the key differences between them. After shooting, the sound editing team began by preparing pre-mixes know as “stems” (typically: music, dialogue, FX-A, FX-B and foley). These stems served as the basis for the initial theatrical showings of the film, on both the 35mm format with Dolby Stereo (4 channels matrix-encoded into two optical tracks), and the deluxe 70mm prints, which featured the Dolby “baby boom” audio on 6 discrete magnetic tracks. It is clear that Ben Burtt and his sound crew scrambled to create the initial two sound mixes in the weeks leading up to the film’s premiere. During post-production, sound mixer Derek Ball was sent to Shelagh Fraser’s house to record replacement dialogue for Beru Lars. Also, according to Anthony Daniels, C3PO’s tractor beam line was recorded long after filming had finished, on his own in a broom cupboard in London. The recorded tape was biked to the airport so the line could be inserted into the movie ref - although perhaps it arrived too late as the line did not appear on the initial mixes. Star Wars Year by Year : A Visual History states that the line was first included in the July 1978 theatrical re-release. At the time the original Dolby Stereo mix was created, it was envisaged that this would be a single inventory release for all domestic theaters. As this was a relatively new idea, the Dolby Stereo mix reflected a somewhat cautious and conservative approach to properties such as dynamic range, width of stereo image and low frequency content - the concern being that the majority of houses at the time were equipped with generally low quality mono sound systems, and there was little confidence that those that did have the facility for stereo reproduction were set up properly. The 70mm “Baby Boom” format used the same 70mm format as Todd-AO with some slight modifications. There were three speakers behind the screen designated left, center, and right. There was also one surround channel and two low frequency effects channels that accepted frequencies below 200 Hz. This format, with discrete channels, greater clarity and dynamic range characteristics, and bass extension, obviously offered more options for the mixers to draw on. There was also a mix created for the 35mm four-track magnetic Stereo format, destined for international prints. Very little information is available regarding the properties or content of this third mix. After completing the multi-channel versions for the first prints, the sound editors created yet another mix, a single-channel monaural track. This mix was to be included on prints destined for theatres not equipped with stereo sound systems, and for ancillary markets. While the mono mix could have been created from the Dolby Stereo master by “folding” the tracks into one, instead the team decided to create a new dedicated mono mix from scratch. The early home video releases on VHS and laserdisc (also more obscure formats such as Betamax, CED and VHD) featured the Dolby Stereo mix, identical to that heard on the 35mm theatrical prints. The superior source being the Japanese pan & scan laserdisc released in 1991, which contains uncompressed digital stereo audio. Playing the mix through a home Dolby Pro-logic decoder authentically recreates the original 4-channel surround experience. In 1985, when Fox decided to re-release Star Wars on video with a digitally remastered audio track, sound designer Ben Burtt asked to be involved. What Burtt actually ended up doing was creating an entirely new sound mix for the film - so the audio for the 1985 video release is actually the fifth official Star Wars audio mix. It’s possible that the 1977 35mm magnetic 4-track master was used as the source for this new mix. Among the clean up and digital repairs, some interesting new changes were added. These include sweetened sound effects, new stereo’d effects and the addition of C-3PO’s line in the Death Star. This new sound mix was used for every subsequent video release until 1993. The original theatrical version on the 2006 DVD release bonus disc also sports this 1993 mix. The original mono mix and 70mm mixes have never been released on home video (the 1985 home video mix may be equivalent to the 35mm 4-track mix). A fan project to restore the original mono mix (as sourced from various recordings of TV broadcasts), lead by an originaltrilogy.com member named Belbucus, was completed in 2007. The project thread can be found here. 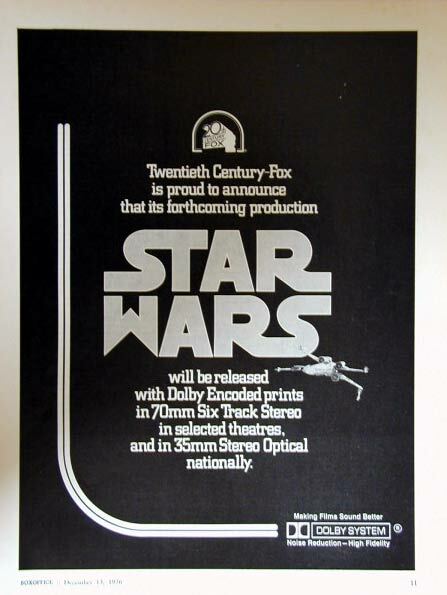 The only references available for the 70mm mix were “in-theatre” recordings made by fans with portable cassette recorders. A comparison of one of these recordings against the 1993 mix can be viewed here. A fan project to recreate the 70mm mix was completed by a member called hairy_hen; details can be found here. These fan-made audio tracks have subsequently been used in several restoration projects, including Harmy’s “de-specialized edition”. The original Dolby Stereo mix has narrow stereo imaging (soundstage), and a low dynamic range (volume difference between quiet and loud sounds). The 6-track mix has considerably more dynamic range, a much wider stereo image, and a significantly “weightier” presence overall. The original Academy mono also has a low dynamic range (obviously no stereo imaging). The 1985 remix has a wider soundstage, but still a low dynamic range. The 1993 remix has both a wide soundstage and a high dynamic range. In terms of content, the 6-track is almost identical to the Dolby Stereo mix, because the two mixes were both mastered from the same stems. There are however a few spots where the effects mix differs noticeably, mostly to bolster the impact of loud sections in the main channels as well as the boom track. At the points where the blockade runner hits the screen, and where the escape pod is launched, there are additional sound effects in the centre (and boom) channel(s) offering a sharper attack and heavily pronounced bass. When Han takes out Vader’s first wingman in the trench, the explosion sound is completely different - a deep explosion that emanates primarily from the left and boom channels. These differences can also be heard in the 1993 remix, and were not part of Burtt’s additions at the time. The alarm on board the rebel blockade runner makes a different sound. Most of Aunt Beru’s lines are different takes (see the discussion here). Chewie has several extra growls in the mono mix that are not heard in the Dolby Stereo mix. When Luke and Ben come across the slaughtered Jawas, R2-D2 beeps. As the group heads into the cantina, a cantina band musical cue can be heard. The cantina patron known on set as “Snake Head” (known later as Dice Ibegon) makes chirping sounds in the mono mix. The chess monsters make more noise and sound more vicious. When the Falcon comes out of hyperspace there is a pronounced deceleration sound–a winding down sound effect. After Han says, “Chewie, jam its transmissions” a radio frequency type sound effect is heard when Chewie flips the switches. A different sound effect is heard when the Falcon is caught in the tractor beam. When Chewie beats on the trash compactor door, a knocking sound is heard. The hard, repeating echo in the chasm is not heard. “I think we took a wrong turn… think we took a wrong turn…” etc. When Princess Leia fires the blaster in the chasm there is a distinct gunshot sound. Usually referred to as the “.44 magnum”. The “Close the blast doors!” line is added. More sound effects are heard as Luke charges up the gun turret on the Falcon. Luke’s line “So, you got your reward and you’re just leaving then?” is a different take. Porkins’ scream is not heard in the mono sound mix. The voice on the Death Star–“The rebel base will be in firing range in seven minutes.” etc.–is different. Content of the 1985 mix is very similar to the original Dolby Stereo mix. There are some newly “stereo’d” effects (Jawa voices after Artoo’s capture) and, most noticeably, the addition of C-3PO’s line in the Death Star (“The tractor beam is coupled to the main reactor in seven locations. A power loss at one of the terminals will allow the ship to leave”). Additional explosion sounds have been added to the initial Tantive/Star Destoyer battle. The laser blast that convinces 3PO to get into the escape pod now has an added impact noise. When the Millenium Falcon exits hyperspace into the meteor shower, the sound of debris whizzing past the ship has been added. Sound of laserfire has been added when the imperial fighter flies past the Falcon. During the blaster fight in the detention block, additional laserfire and the sound of shattering glass has been added when the wall “cameras” are taken out. Additional laserfire effects have been added to the fight before our heroes escape down the garbage chute. Various additional laserfire effects added for imperial fighters and death star gun turrets in the final battle sequence. Additional explosion effect when R2 gets hit by Vader. Thanks for posting this, Moth3r. Agreed, much more informative than my post in harmy's thread. Awesome, thanks for posting. I love reading this stuff. For some reason I'm just so fascinated by the differences in these audio mixes. One difference I didn't see listed is the sound effect when R2 hits the ground after getting blasted by the Jawas. I think the effect is slightly different/longer in the mono mix. Speaking of audio, Belbucus' Audio Resources seem to be missing many critical parts AFAICT (it's pretty old). If anyone can help, let me know. I wish we had more concrete information on what exactly the "1985 home video mix" really is, I'm not saying that the info provided is wrong but this David C. Fein fella provide incorrect information in other instances on that page. Is this the only source of information we have on that mix? Who knows what the fourth format (35mm four-track magnetic stereo) made for international release sounded like. I always wondered where this information came from. The only official confirmation came from the packaging back in 1984/85. But I have never found any reference of Ben Burrt himself saying that he remixed the sound in the mid 80's. In the DVD commentary for Ep IV Burtt refers to a 2 channel stereo mix. That image is seriously screwing up my reading pleasure. Could you reduce the size please. 2) Hairy_hen has said in Harmy's thread that "the '77 version has the channels panned inwards by a fair amount (presumably this was to reduce crosstalk in the surround, since upmixing processors were less advanced in those days), while the '85 has the full stereo width"
So in my mind, the 85 is a tweaked and modified 77 stereo mix. So yes, in effect a new one. Another mono change, when in the trash compactor, there's an alternate take used when Han says "get on top of it" instead of simply "get on top". Well of course it's a different mix than the optical 35mm Dolby Stereo, my point was; do we actually have more information on this "1985 home video mix" other than that old quote from David C. Fein? and later in June in 35mm Academy Mono. The fact that a fourth format was made available for international release; 35mm four-track magnetic Stereo, (probably made available because Dolby was still fairly new back then) begs the question, what was the content like on those prints? That Burtt would've made a new mix for home video in '85 isn't hard to believe, that's what everyone says happened, it's just that it would be nice with more actual info on this rather than just that old quote. Right, gotcha! Well the international versions will be even more different because there would have to be redone foley work for all of the on set sound that wasn't captured, along with the dubs, then they would all be remixed. I really doubt that Burtt surpervised those mixes - I say that because Darth Vader's voice effect in the French dub is really cheap sounding. Almost like the actor is talking through a tube. In any case, the German people might know best, but I think they are more influenced by the mono mix than the stereo mix in terms of effects and dialogue. A lot of confusing facts in that article you posted and it's easy to see where that article is wrong but IMO it's entirely possible that the "'85-mix" is in fact a more rarely heard fourth theatrical mix from '77. Mavimao, remember that not every country dub their films. And as far as I know Lucas and Burtt was quite involved when it came to those foreign mixes as well. I have no idea how much they were involved in these mixes. I assumed they just sent the stems to dub houses across the world and they would take care of it from there. I just don't know why they would listen to French, Spanish, German, Italian dubbings when it was just a question of sweetening the levels. But if they were that dedicated, cool! As far as non-dubbed foreign releases, I would say it was the mono mix that was sent out. Just look at puggo's swedish 16mm (can't recall the name) and the various vhs broadcasts from the 80s in Europe : they have the mono mix. Thank you for this thread and thanks to Mavimao who led me here. I do currently literally GERMAN subtitles and wondered because of the missing lines which is now clear. So I'm not certain which version I was addicted as child but most likely the 85 version taken from television(?). I love danny_boy's sig: It's the story that makes this movie. Nothing? else. Anyway I look forward to see the German despecialized version - can't wait it. Thanks again for this informative thread! Did you grow up listening to the movies in German or English? Both stereo and mono versions could be seen in Sweden as far as I know, it's just that not that many theaters were equipped with the then quite new Dolby system. I'm not sure but I don't think any theaters in Sweden were equipped with it yet, only one or two theaters I can think of if that was the case, I know that it was in place for Alien in '79 and ESB premiered in 70mm. Anyway, it was the Dolby system that was new, stereo and surround had been in place for a long time, UK and bigger countries than little Sweden certainly had their fine presentations including Dolby Stereo and as already mentioned four-track magnetic stereo prints were shipped out. It's not like the stereo versions were US exclusive. Still, I'm not saying that what was included on the '85 home video release is not a home video exclusive mix, as such things are quite common afterall. It could very much be the case but if we only have that quote without any facts, anything is possible IMO. The reason I have become a little hesitant towards this info, is because that page contains factual errors from this same guy, and I just wonder if this '85 mix info originate with this old blurb? Haven't been able to find anything else regarding it, have you? It would make sense though - instead of a new remix, the 1985 release had its audio digitally remastered from an existing mix. Then again this David C. Fein seems to have credentials (despite the inaccuracies about the ISR laserdisc) - it looks like he now works with Michael Matessino (the guy who gave us the list of ESP 70mm print differences) at a DVD production company called Sharpline Arts. I had a trawl through some old Usenet posts on Google Groups to see if there was any mention of the 1985 mix. Nothing turned up - it seems that was very little knowledge back then about the fact that there were three mixes, and people even then were debating about the Biggs scenes and the grappling hook miss! I did find one interesting fact, though - in 1990, Star Wars was shown on the Disney channel with the tractor beam line included. Would this be the mono mix or the 1985 stereo mix? That's great info, moth3r! yeah there are inaccuracies with both the ISR LD's and the pan & scan transfers, but that certainly gives it more weight. No one is perfect and that site and info is old anyway. Damn, I had hoped there would exists some more info regarding this, I also guess if what he states is correct - an early home video mix rather than just remaster, I guess it will be hard to find any info on it due to when it took place, maybe there was some blurb in a magazine back in the day when this VHS was released. interesting that they were broadcasted on Disney channel, I guess it must be the "'85 mix" as he later mention the different Aunt Beru voice as a deviation in the 16mm. While information about the '85 mix is hard to come by, certain qualities of its sound can lend themselves to informed speculation about its origins. 1) The '85 mix has full stereo imaging compared to the '77, which has been panned inwards. 2) The '85 mix shows somewhat improved fidelity compared to the '77, most noticeably in its lesser amount of tape hiss. 3) The '85 mix lacks the pronounced music reverb heard in the '77 during the quad laser battle and the end credits. 4) The '85 mix has been dynamically compressed to a greater degree than the '77. 5) With the exception of C3PO's tractor beam line, the '85 is identical in content to the '77. Nonetheless, certain sound effects occasionally 'feel' slightly different, perhaps due to the use of different compression and/or EQ during mastering. 1) The 70mm version had a few additional sound effects not heard in the 35mm stereo mix, which also do not appear in the '85 version. 2) The '97 SE mix, which is said to have been derived mainly from an original 4-track master, does not contain these 70mm additions either. 3) The stereo imaging of the '85 mix seems to line up exactly with what is heard in the 70mm and '97 mixes (apart from the changes, obviously). 4) The 70mm and '97 versions do not contain the additional music reverb. What may we deduce from this evidence? 1) Despite their overall similarity, the '85 mix could not possibly have been derived from the original 35mm stereo. The missing reverb alone would tell us this much; and the imaging discrepancy lends it further credence, for while there are ways of widening a stereo field, it is unlikely that artificial processing after the fact would yield a result that aligns so closely with sources that had not been narrowed to begin with. 2) The '85 mix must therefore have been derived from an earlier generation source that did not contain the reverb or any added sound effects, and had the full panning width. 3) The similarity of the '85 and '77 stereo versions, in spite of the differences they do display, is such that they must have a common ancestor in their background. When we add up the facts, it seems to me that the most logical conclusion would be to say that the 1985 stereo mix is derived from the original 4-track master. It is a fresh downmix of an early, discrete channel source, with the tractor beam line added on top and the dynamics compressed down to a level that was deemed acceptable for home video release. This explanation accounts both for the similarities and differences between versions and makes the most sense given the audible properties of each, as well as fitting with the information available to us about these matters. Interesting, didn't know that, do you know if this is the case with all incarnations of this mix? I recall that you found the SWE Technidisc to be the loudest of the bunch in your investigations. Would be interesting to compare all pressings and incarnations of this track in even more detail sometime, from all LD's all the way from '86 SC up to '93 SWE, from Japan pressings: Pioneer and Mitsubishi to USA pressings: Mitsubishi, Pioneer and Technidisc. overall the best sources for these tracks so far, am I right? Yeah, it's important to select your wordings right, I said '85 re-mix earlier which is of course an inaccurate description when it is its own mix or digital remaster. So I'm sorry if what I said implied that it could be a remix or a derivation of the 35mm Dolby when it's clearly not. All theatrical stereo mixes was derived from the 4-track master mix, that is the groundwork. Still it's impossible to tell for sure without more information if the '85 mix was a fresh down mix from the master tapes or a remaster of an existing mix. We can only speculate even with these facts at hand. That's why it would be nice with more concrete info about the creation of this track. When it comes to the '93 mix and '97 mix we know for the most part what was done, on this track we only have that quote. - I say that because Darth Vader's voice effect in the French dub is really cheap sounding. Almost like the actor is talking through a tube. That's because Lucasfilm didn't give any indications on how to do the "Vader's voice". So the french team has to find a way to recreate it. Here is an interview of Perre Davanture, the french sound engineer who do the job : http://www.objectif-cinema.com/spip.php?article4547&artsuite=8 . He explain his work and he clearly say that Ben Burtt came for the mixing. La Gazette du doublage : You worked on the first Star Wars movie. What do you think of this first trilogy? Have you worked as a sound engineer or technical manager? Pierre Davanture: When Michel Gast and I have watched Star Wars (1977) to prepare the dubbing, it is true that we were very impressed and immediately made special arrangements. Knowing that mixing would be done in Paris, in stereo 6 tracks (for 70 mm release) we immediately considered the main auditorium of the SIMO de Boulogne. I contacted my friend Jean Neny who has kindly come watch the film. Before the screening, he said: "It is important that it is for you that I come to see a movie before mixing" but after the screening, he admitted that I had done well considering the film. We decided that I'd tests rigged voices for Vader and C-3PO and that I will provide to the mix, strips mounted distorted for each character. With only a harmonizer, I distort the voice of Roger Carel for C-3PO. As the voice of Vader, we have not been able to get the U.S. production unit used, I used the harmonizer to lower the tone of voice of François Chaumette. Then to recreate the resonance effect of the mask, I thought, as I often did, to get closer to reality. We then made a chest latte (about 40x25x30 cm) inside of which was placed an omnidirectional microphone and a small 12cm speaker, mounted on a pivot so that it can be orient for best results. Our chief editor Maurice Martin prepared the french speaks tapes and Jean Neny, in the studios of Boulogne, made mixes in the presence of Ben Burtt, the sound engineer of the production. La Gazette du doublage : Do you have specific recommendations for Lucasfilm / Fox dubbing? Tell us about your collaboration with Jean Rouat, Jean Neny and Ben Burtt, sound engineer at Lucasfilm? Davanture Peter: No, we did not have any recommendation of the production, since we were not even able to get the reference device used to Vader. As director of the dubbing service in SND, I organized the work as explained above, in agreement with Michel Gast and to the tricks about the voice. Jean Rouat recorded the dialogues. Maurice Martin assured the lyrics synchronization and dispatched bands for mixing. I just met Ben Burtt at the time of mixing. The mixing was directed by Jean Neny. I understand that the French voice actors who dubbed Star Wars were quite famous actors in their own right. Apparently, an article about dubbing the new scenes in the SE was printed in 1997 in "Les Années Laser", a French magazine about home cinema. There was a history of "who dubbed what and how" and also an interesting statement about the sound of the French LDs being plain stereo and not Dolby Surround because the original 1977 French mix for the movie was only a 2-channel stereo mix due to limitations of French theaters at the time. (Same statement appears on the lddb listing here).